Intel has certainly been on a roll for the past year, and from all indications there's a good chance this will continue for the foreseeable future. Even though they are looking down the barrel of AMD's K10 gun, with Barcelona scheduled to launch next week and Phenom later this year, they are continuing to release product at a brisk pace and seem unfazed by what their competitors are planning. It is this focus that has brought us the Core 2 processor family and a string of new chipsets since June of 2006. Instead of taking a breather or resting on its laurels, we will see several new chipsets and processor families over the course of the upcoming year as Intel continues to march to the beat of a company looking to annihilate everyone and everything in its way. While you can debate the merits of their product lineup, potential performance improvements, costs, or what it all really means for the consumer, you cannot deny their tenacity in trying to address just about every sector of the market they serve with a class leading product. One of those market sectors consists of a very loyal and very vocal group: the computer enthusiasts whose lust for the latest and greatest technology often drives the market to innovate at a pace faster than it normally would. The next chipset on Intel's product road map is designed specifically for this group, but it should also find its way into the workstation market in a short time. This chipset is the Intel X38 that will replace the venerable 975X as Intel's performance oriented offering in the enthusiast market. The P35 has been an excellent chipset, serving user needs across a broad range of products starting with boards like the budget-priced/performance-oriented abit IP35-E up through the midrange Gigabyte GA-P35-DS3R and beyond that to the über-expensive and tweakable DFI LANParty UT P35-T2R in the DDR2 sector. The P35 has also been shown to be an admirable performer when matched with high speed/low latency DDR3 in boards such as the Gigabyte GA-P35T-DQ6 and ASUS P5K3-Deluxe. Intel designed the P35 with the mainstream market in mind and always planned on the X38 being the chipset that would offer the next step in performance, whether that was in a multi-GPU situation with dual x16 capability and enhanced throughput, improved memory/chipset performance, or as a great overclocking platform for a wide range of Core 2 processors including the upcoming Penryn series. We will go into detail about the X38, its range of capabilities, and design aspects when the chipset officially launches on September 24th, but for now we will provide a very early look at its performance with the Gigabyte GA-X38-DQ6. In fact, this preview is based on an engineering sample board and BIOS, but we felt like the progress of the X38 chipset on this particular board warranted a sneak peek of its performance capability - or in this case more like its potential. Our testing today is centered on a select group of synthetic and application benchmarks that will provide a general indication of how the X38 currently performs with beta hardware. We will follow up shortly with results from a retail board/BIOS combination that will focus on CrossFire (sorry, as of now there's no official SLI support), overclocking, power consumption, and additional application benchmarks. Let's take a quick look at the performance of the Gigabyte GA-X38-DQ6 against one of the better P35 boards on the market today. According to the INQ, this mobo will be available on the 14th, tommorrow. I've only found retailers for this board in the UK. Anyone been able to find a USA retailer(s) that have this board for preorder? Are such powerful PSUs utilised in overclocking articles? I am thinking of buying this board and running it with an E6850, 4Gb RAM and a 8800GTX, 2 SATA drives and 3D Galaxy2 water cooling but my PSU is only rated at 500W (Enermax Liberty). 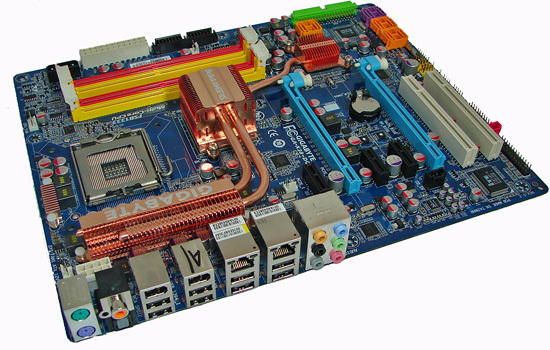 Would this motherboard pose any problems installing a large heatsink with backplate such as a thermalright ultra 120 extreme as I have seen similar gigabyte products where you cannot install bolt through coolers due to copper blocks on the back of the motherboard. so not neglectible difference between P35 and X38, just like P965 and x975 weren't that much different. This is an NVIDIA issue. NVIDIA needs to allow it in their drivers, or the only way to make it work will be hacking drivers. There have been various custom driver releases in the past to get SLI working on certain chipsets - i.e. the Alienware m9750 laptop and other SLI laptops are 945GM chipsets but still support SLI. The real issue here is whether or not Intel will pay NVIDIA... and how much NVIDIA wants to be paid, I would assume. Gary and I have had conversations about this, and while the NVIDIA GPU guys would love to get Intel chipset SLI support, the NVIDIA chipset guys are understandably not as gung-ho. Personally, I'd say their chipset business on the high-end doesn't do enough to compensate for the number of 8800 cards they could sell if they were to license SLI support to Intel. Besides, profit margins on 8800 chips (and even 8600) are *much* higher than chipset profit margins. For every 8800 card they sell, they probably make as much as they would off of four SLI chipset sales.